Britain After Rome: The Fall and Rise, 400 to 1070 should perhaps have been a different book altogether. 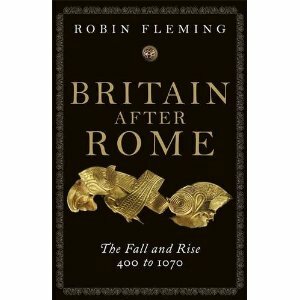 The product of ten years’ work on the part of Robin Fleming, a professor at Boston College (Boston, Massachusetts, USA), Britain After Rome was commissioned by David Cannadine within the Penguin History of Britain series. It covers the huge span of time — nearly seven centuries — that elapsed between the departure of the Roman legions and the arrival of William the Conqueror. As such, it follows in the footsteps of at least two other Penguin volumes: The Anglo-Saxons (James Campbell et al, 1991) and The Beginnings of English Society (Dorothy Whitelock, 1963). Based on all this, it would not be unreasonable to assume that Britain After Rome was intended as a general introduction to this large, complex and in many ways intractable subject — a book for students, clearly, but perhaps also for the casual museum visitor who has been stunned by the splendour of the Staffordshire Hoard and wants to know more, the casual reader wondering to what degree The Lantern Bearers (1959) makes any sort of historical sense, the anxious observer of current affairs hoping acquire a longer view regarding the challenges, curiosities and catastrophes of our own time. Yet Britain After Rome in fact strongest precisely at the point where it stops trying to pass itself off as a generalist introduction. Far and away the best thing about the book is the final chapter, “Living and Dying in Early Medieval Britain: The Fifth to Eleventh Century” [sic]. Here, with the end in sight, as it were, Professor Fleming is at last able to bypass aspects of human experience that don’t seem to engage her quite so fully — religion, politics, warfare, agriculture, craftsmanship, linguistics — and can concentrate fully on the part of her subject to which she brings the most obvious energy. The result, to be fair, is a minor tour de force of archaeological writing. Leaning heavily on excavation reports from burial sites, and in particular on the insights of osteo-archaeology — a science which has advanced considerably since 1991, let alone 1963 — Professor Fleming sets out in the final chapter to write the biographies of three anonymous women, poignantly identified in the text only by the numbers assigned to them in the course of the relevant digs. Thus we read about ‘Eighteen’, a high-status leper — ‘her face would have been an infected, discharging horror’ by the end of her life, we are told, yet her burial could hardly have been more careful, elaborate or respectful. We also read about ‘Forty-Nine’ and ‘Forty-One’, buried together in the same grave. ‘Forty-Nine’, it turns out, was clearly dead when she was buried — whereas ‘Forty-One’ was all too clearly alive, pinned down onto the corpse of ‘Forty-Nine’ with a heavy stone as the clods of earth fell down on her — her living burial perhaps punishment for the part she may have played in the death of ‘Forty Nine’? No one can be sure, of course, but there is something about the specificity of these three individual deaths that brings Professor’s writing alive, bringing to her reflections on the broader issues raised by these burials — issues of early medieval health, what are known in the trade as ‘anomalous’ or ‘deviant’ burials, social control and judicial killings — a genuine flair and energy absent from much of the rest of Britain After Rome. The point, really, isn’t that Britain after Rome is somehow a bad book, but rather that a book-length version of this final chapter would have been a much better book. Did Professor Cannadine’s commission somehow divert Professor Fleming from a different path, at the end of which we might have ended up with three or four hundred pages of engagement with early medieval English burials, lots of vigorous discussion of arthritic hips, worn-down teeth and malformed pelvises, poignant stuff about mothers buried with their stillborn infants, diet and social stratification, the practicalities of cremation versus inhumation, the meaning of burials alongside ox-skulls or beavers’ teeth, in short an unsqueamish long look at the realities of early medieval English death, on the understanding that enquiries of this sort are a necessary and important way of discovering something about early medieval English life? If so, this diversion ought perhaps to be a source of regret. Clearly, Professor Fleming knows a great deal about her subject area. She has clearly attempted to produce an account of it, emphasising the insights of archaeology, material as well as textual evidence, the experience of ordinary people as well as elites, presented for the most part with rather more colour than one often finds in academic texts. Few readers, one suspects, could put down this book without having gained something worthwhile from it — the fact that at St Albans, for instance, a large Romano-Celtic temple, apparently dating from the 1st century AD, was built around the high-status burial of an unknown yet clearly very important man, centuries before the cult of St Alban himself began to be celebrated precisely one hill away. Nor is the topic an easy one to address. Archaeology, as Professor Fleming is quick to admit, favours some sorts of information over others, so that e.g. people who own lots of bits of metal end up far better documented than those who do not. Yet because of the gaps in documentary evidence for the period in question, uneven and equivocal information is, alas, pretty much as good as it gets. Yet whatever the limitations within which Professor Fleming was working, none of this really excuses the fact that Britain After Rome isn’t really the generalist introduction its place in the Penguin History of Britain suggests it ought to be. Perhaps the most glaring defect of the book is the fact that it simply doesn’t do what it says on the cover. Surely a title like Britain After Rome does rather tend to imply that the subject-matter of the book involves Britain, i.e. the whole island of Britain, Scotland included? (And yes, I do realise that the Roman province of Britannia didn’t reach all the way up into Scotland — but this is a book in English, titled in English, in which one might reasonably expect the word ‘Britain’ to be used in its English-language sense.) Title notwithstanding, however, while Britain After Rome provides a passable account of events in England and Wales, it pays only the most glancing attention to regions further north. And that, of course, is a pity. Not least, during the epochal events of the period 400 to 1070 AD — a time marked by movements of populations, shifts in religion and language, political and military competition of a high order — there was presumably nothing inevitable about the distinction between the nations we now call ‘England’ and ‘Scotland’. If the events of that period played a part in creating or reinforcing such a distinction, might that not have been worthy of notice? Alternatively, if those involved with the production of the series had somehow thought Scotland irrelevant to their History of Britain series, why not simply change the title of the volume in question to reflect its actual content? Admittedly, much of what is wrong here can hardly be blamed on Professor Fleming. The lack of footnotes, for instance, is consistent throughout the Penguin History of Britain series. The thinking behind this is, presumably, that ‘ordinary’ readers will suffer terminal alienation at the merest glimpse of functioning scholarly apparatus — although the effect, it must be said, also prevents ‘ordinary’ readers from e.g. tracking down references on the subject of that early temple at St. Albans, mentioned above. While the ‘Further Reading’ section is welcome, it might have worked better as an essay than as a series of bald lists. Faced with little more than a catalogue of titles — many of them blandly general, others the dauntingly specific products of specialist periodicals — what is the ‘ordinary’ reader to do? On a related note, a better editor might have smoothed out some of the oddities that occasionally turn up in Professor Fleming’s prose. It would be tedious to catalogue these at length, so a couple of examples will have to do. There’s a point, on or around p. 106, where Professor Fleming repeatedly uses the verb ‘render’ to mean something along the lines of ‘to offer up’ — reasonable enough, except that as the context relates largely to livestock, one is left with images of the people in questioning boiling up their beasts for fat — none of which would matter, were it not for the fact that ‘render’ crops up three or four times in a paragraph or two here, but is almost entirely absent from the rest of the book. Of course one knows what Professor Fleming means here — but it grates. And on a similar note, on p. 143, we read the following sentence: ‘Something like 15 per cent of all cremations at Spong Hill were occasions on which horses were slaughtered, so the practice was ubiquitous.’ Eh? ‘Ubiquitous’, presumably, other than in the 85 per cent of cases where horses were not slaughtered. Again, though, this isn’t entirely Professor Fleming’s fault. One of the perks of being published by a serious imprint like Allen Lane is — or ought to be — competent proof-reading. Here, at least, it has failed. Yet there’s at least one strand of failure in Britain After Rome for which Professor Fleming must bear full responsibility — a culpably sloppy grasp of cause versus effect, which in turn hints at what may be a more serious issue with Professor Fleming’s willingness to impose her own expectations upon generations long dead. It’s a problem that crops up quite a lot in the text, but most notably so in the various passages where Professor Fleming — incidentally, very obviously keen on egalitarianism, less so on elites — discusses ways in which certain families and individuals used display, the appropriation of traditional sites and emulation of elites elsewhere to bolster their own social standing, notably during activities such as feasts, marriages and burials. Clearly, there’s nothing particularly odd about the idea that people in one place might copy what people in another place were doing. History, and indeed present-day life, is rich in examples of this sort of thing. Yet look how Professor Fleming expresses this point, e.g. on p. 138: ‘ The building of mounds and emending of ritual sites by high-status English pagans may, in part, have been done to emulate the practices of foreign elites’. Or, well, possibly the ‘building of mounds and emending of ritual sites’ was done for profoundly religious reasons, the exact technical methodology perhaps borrowed from neighbours but the actual motivation by no means ‘to emulate the practices of foreign elites’. This may, perhaps, look like quibbling for its own sake. Yet there are other points at which Professor Fleming refers to what are, in essense, strategies of social aggrandizement as if these were the dominant motive force operating in early medieval English society. And again, one would shrug this off as perhaps being the result of an exploration of the past necessarily grounded as much in excavated material culture as in documentary evidence — so, somehow more easily affiliated to materialistic readings than to other approaches — were it not for the fact that similar problems arise quite often in later medieval history, where e.g. the desire for an elaborate tomb, crowds of mourners, the provision of a chantry chapel or some other highly-conspicuous form of funerary behaviour is consistently read as showing off — impressing the neighbours, setting down a marker for social pretensions — rather than as the expression of a series of deep-seated, entirely genuine needs one might as well label, for want of a better term, ‘spiritual’. In truth, we cannot know with any certainly what individual men and women of the 6th or 8th or 10th centuries experienced when they parted company with their dead — far less even than we know about their equivalents in the 14th or 16th centuries — but we can at least make a serious effort to avoid imposing upon them the failures of our own imaginations. Incidentally, the same argument could be made about the ways in which Saxon elites regarded their ‘low status agricultural workers’ (that handy term ‘peasant’ having sunk long ago under the burden of compulsive historiographical backbiting) — purely instrumentally — or through the language of economics — or through a tangle of beliefs about lordship, charity and the proper ordering of society, all very much bound up with what we would now regard as religious conviction? We can examine the evidence, make guesses and test these again further evidence as it arises. What we shouldn’t do, in contrast, is to project our own blind spots onto the past any more than is absolutely necessary — or, at any rate, to show a degree of self-awareness when, perhaps inevitably, we do so. Having lived through eight years of the presidency of George W. Bush, I am more willing than I used to be to concede that people at the top can have dramatic effects on the lives of individuals and on the societies in which they live. Acculturation and accommodation are always more likely between people who inhabit similar economic, social and cultural universes, and by the end of the sixth century the elite societies of Welsh Britain, Irish Britain [!] and English Britain looked much the same. But there is a dark side to similarity. Political competition, ideological differences and ethnic distinctions often arise between people who are much alike. These things came to take centre stage in Britain in the seventh century and have dogged the politics of the British Isles from then until the twenty-first century. So — it appears that Britain, although in some ways marked by ‘similarity’ at least amongst its ‘elite societies’, also has also experienced, over the past 1,300 years or so, ‘competition’, ‘differences’ and ‘distinctions’. Who knew? There is, as I have repeatedly insisted above, quite a lot in Rome After Britain that is well worth reading. Slowly yet also dramatically, archaeology is altering our understanding of what used to be called Dark Age Britain — not just spectacular discoveries like the Staffordshire Hoard, either, but perhaps even more so, the patient excavation and examination of unremarkable-looking scraps and shreds and filled-in holes in places that will never become Sutton Hoo-type household names. We can now be pretty certain, for instance, that Christianity, once introduced into Britain around the 3rd century, never entirely went away, as strange and surprising as some of its post-Roman, pre-Gregorian manifestations may possibly have been. And we can now know considerably more about how alien, or otherwise, the Saxons — elite or non-elite — of 1066 might have found their Norman opposite numbers. Rome After Britain reflects much of this. To that extent, it’s a useful book. And in the passages where Professor Fleming is able to get to grips with the specificities of individual burials, for all my reservations about Professor Fleming’s assumptions regarding issues of faith and hierarchy, it often feels like something considerably more than merely ‘useful’. Yet at the same time, the limitations of Rome After Britain are such that, while it doubtless deserves a place on the same shelf as those volumes by James Campbell and Dorothy Whitelock, it by no means replaces either of them. The Whitelock volume, now more than 40 years old, still provides a more accessible account of everyday life amongst the Saxons — with a self-conscious emphasis on how ordinary people lived, no less — including art, architecture and poetry, while the Campbell volume — well-illustrated by the standards of its time, in contrast with Rome After Britain‘s total lack of illustrations — is simply a much clearer, more accessible, more effective survey. And as for the Lantern Bearers, as far as that goes — when Rosemary Sutcliffe set out to explore what it might have been like to have endured the historical climacteric of Roman withdrawal from Britain, in a narrative crosscut with her own personal preoccupations, expressed in a way that spoke as clearly of 1959 as it did of the 5th century — ‘We are the lantern bearers, my friend; for us to keep something burning, to carry what light we can forward into the darkness and the wind’ — she didn’t feel constrained to express the result of this exploration through the medium of academic history. Would that Professor Fleming had been able, in this instance, to have enjoyed a similar degree of liberty. Thanks for the review! Is there a good modern book on the end of Roman Britain, and what happened next? The answer to that, zornhau, is that it depends what you’re after. There are plenty of good books about Roman Britain, addressing with varying degrees of seriousness the issue of how it all ended — and then there are plenty of good books about the Saxons. Unfortunately, though, while I’ve been looking recently for books about ‘what happened next’ — the messy bit between the departure of the Romans and the re-emergence of semi-reliable historical sources from the 7th century or thereabouts — there’s nothing I’ve found that’s so wonderful as to make me want to recommend it in a wholehearted way. So, in a sense all I can really do is to echo your question. On a more positive note, though, I do think we are living in very exciting times when it comes to learning more about ‘what happened next’, if only because the technical possibilities of archaeology are developing so fast. Chris Wickham’s recent book , The Inheritance of Rome, covers the period in question but takes in the whole of Europe. It was well-reviewed and is no doubt very sound. I nevertheless found it heavy going – too much like a text book. The British bits, however, were some of the more interesting. At the other end of the scale, the most fun I’ve had reading about the Anglo-Saxons recently was in Peter Ackroyd’s ‘Albion: the Origins of the English Imagination’. As ever with Ackroyd, plenty of potentially unsound speculation but very enjoyable (probably as a consequence!). On the whole, though, I did find persuasive his argument that the Anglo-Saxon cultural inheritance was persistent, influential and important. Having overdosed painfully on Ackroyd a decade or two ago — back when Hawksmoor, Dee and Dickens were getting the Ackroyd treatment — it’s a struggle to enjoy as much as I probably should the prospect of new subject-matter being subjected to that dense prose style, the preference for the perverse or gloomy, the blinkered yet nightmarishly persuasive Ackroyd vision. On the other hand, as you will doubtless have noticed from my account of that Fleming book, I’m not altogether sure that there’s much to be done about what used to be called Dark Age Britain other than ‘unsound speculation’, or at any rate speculation that treats the relative lack of evidence as liberating, rather than constraining. So, well, I probably ought to give Ackroyd’s ‘Albion’ a try. As for the Chris Wickham book, again, many thanks for the (limited) recommendation. Not much reluctance there — into the Amazon basket it goes! Incidentally, my favourite not-entirely-respectable history book of the moment is UnRoman Britain: Exposing the Great Myth of Britannia by Miles Russell and Stuart Laycock. It’s an eccentric yet thoroughly enjoyable attempt to write about the failure of liberal imperialism in Iraq and Afghanistan by way of pretending to write a book about the limits of Roman influence in Britain. Or something like that. As ever, though, Laycock balances the kite-flying with enough ‘proper’ history to produce a thought-provoking account. I’d recommend it for anyone who wants to try to imagine what the chaos of post-imperial Britain might possibly have felt like in practice. Barendina, I think your points about Ackroyd are spot-on. I too had tired of all that speculative psycho-geographical blather and hadn’t read anything by him for a decade. But his approach seems to pay off when dealing with something as intangible as the English imagination and an era with as few sources as the Anglo-Saxon. A few informed imaginative leaps work wonders. I recommend it to you, not least because I’d love to read what you thought of it! BTW there’s also some interesting stuff about early Islam in Wickham’s book. The area is vast as you say and it is after all still the ‘Dark Ages’. Try Leslie Alcock’s ‘Arthur’s Britain: History and Archaeology AD 367-634’. It’s a good book which blends history and archaeology well and Alcock does not have an anachronistic agenda. According to some postgrads I know, Alcock is out-of-date (as is John Morris). Gareth, you are doing almost too good a job of selling me these books — not least as the links between Islamic culture(s) and Late Classical civilisation [those who enjoy scare-quotes may distribute them as they like at this point in the proceedings] constitute a topic about which I’d love to know quite a lot more. And thanks, too, Richard! Having looksed at the Leslie Alcock book recently, and not been quite sure about it — because let’s face it, books about early medieval history using the name ‘Arthur’ in the title do sometimes have something more than a little insane about them — I now pronounce myself entirely reassured. What an expensive day for book-shopping this is turning out to be. Incidentally, for those who haven’t noticed this already, Richard’s own blog is quite simply one of the most unpretentious yet unambiguously enchanting things on the internet these days — a reminder for those of us who sometimes need it that there is more to life than what we can see of it in central London — highly recommended! Very kind of you to say that. If you drink scrumpy reading books on ‘Arthur’ becomes second nature. Richard — that may well be where I’m going wrong — a notable lack of scrumpy in my life at present! The most stimulating survey of this period I’ve read is MT Clanchy’s ‘England and Its Rulers’. It’s full of interesting discussions and perspectives but is always meticulously grounded in an intimate knowledge of primary sources. I first came across Clanchy through a paperback which took a largely thematic meander through the period but this appears to have totally disappeared from even second-hand online bookshops. Having now had a good look at his works, I’m attracted by his book on Abelard, which looks very good – I may be ordering it for myself. In short, Clanchy’s writing always contains the sparkle of ideas. He’s not a ‘trudger’ unlike many authors of surveys of this period (Robert Bartlett included, I’m afraid). By ‘early medieval’ I mean the very beginning of post-classical, i.e. pre-Norman, which is the way in which e.g. the Fleming book uses the phrase. But then it’s hard to know what any of these things mean, isn’t it? My non-historian friends always used to be amazed that my sixteenth century stuff counted as ‘early modern’ — a phrase which, to plenty of very well-educated non-specialists, really does suggest Cubism, motor-cars and lots of chrome plating on everything! There isn’t, as far as I can see, any very good term for the gap in English history between Romans and Normans — ‘Dark Age’ has been dismissed for being too negative, ‘Anglo-Saxon’ won’t do as it privileges what must for a long time have been a minority population over whatever Romano-British alternatives may have existed, etc, etc — so, in short, all rather confusing. All that said, however, I’m genuinely pleased to have the Clanchy recommendation, even though it sounds rather elusive. Maybe this is a job for the London Library, rather than Amazon? Yes, my nomenclature is dated! I think I recall the description ‘Dark Ages’ – when it was first was coming under attack – being justified as it was an era where there was a lack of primary sources rather than anything more pejorative. Clanchy’s books seem expensive even second-hand so the LL sounds a good option. And yet people (well, subs at the Torygraph, anyway) do use ‘Dark Age’ pejoratively, e.g. here, don’t they?